Located a few blocks from Front Beach, the seaside promenade and restaurants, Sasavuta Hotel is a small place with comfortable rooms that are more expensive than they should be. Average rating 8.3 from 261 reviews. What you pay for are the great modern bathrooms with a shower stall, hot water and contemporary fixtures. The hotel was full when we visited (a testament to the 16-room hotel’s popularity) so we were only able to take a brief look. The rooms aren’t the most stylish and some are better than others, but they do have more charm than your run-of-the-mill modern, skinny Vietnamese hotel. Rooms are well appointed and come with air-con, mini fridge, WiFi and flatscreen TV. It’s not a great value pick but it’s certainly recommendable for someone with a less stringent budget looking for comfort and some personality. 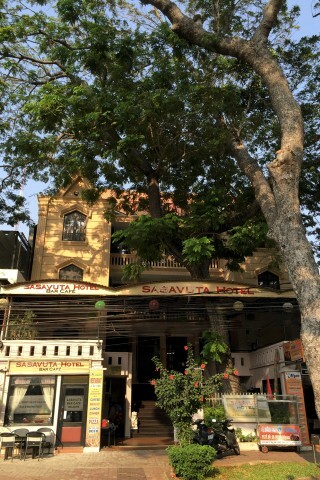 Check rates at Sasavuta Hotel on Booking.com. High season is Fri/Sat nights. Grande deluxe: 700,000/800,000 dong. Room: Deluxe double room, low season: 600,000 dong, high season 700,000 dong. Notes: High season is Fri/Sat nights. Grande deluxe: 700,000/800,000 dong.